Into Hair offers a great package for brides to be. For that special day we offer a free consultation which allows you the time to chat through the look that you want. 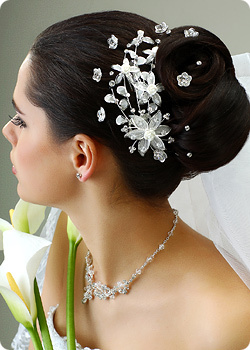 Our experienced stylists can create a very special look for you, for your special day. The wedding party can gain early access to the salon on the date of the wedding, a nice way to start the important day. We also offer an 'out of salon' option - if booked in advance, one of our hair stylists can travel to you (within the Brighton area), so that you can achieve the perfect look at your chosen location. We can also arrange a top class make-up artist for you, if required. After the honeymoon, come in for a free treatment and blow dry to make sure that the sun hasn't played too much havoc with your hair. Please do contact us for a price guide - and also feel free to ask us about our fantastic 'hair-up' service for those other occasions where something special is required.